I have been anticipating writing this post for quite some time. 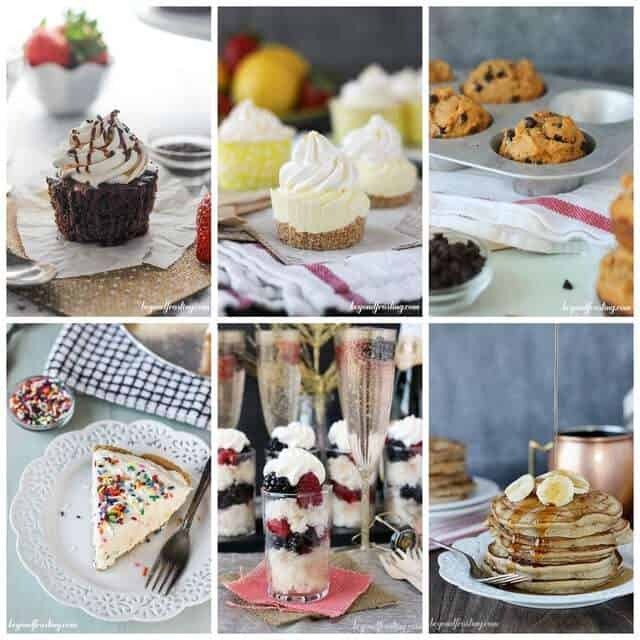 As I continue to navigate my passion for baking and how it fits into my new (although not new) lifestyle of healthy eating and exercise, I find myself constantly seeking ways to feel like I am getting my sweet fix. It all starts with breakfast. I skip on the muffins, bagels and I hide my eyes when I see a donut. 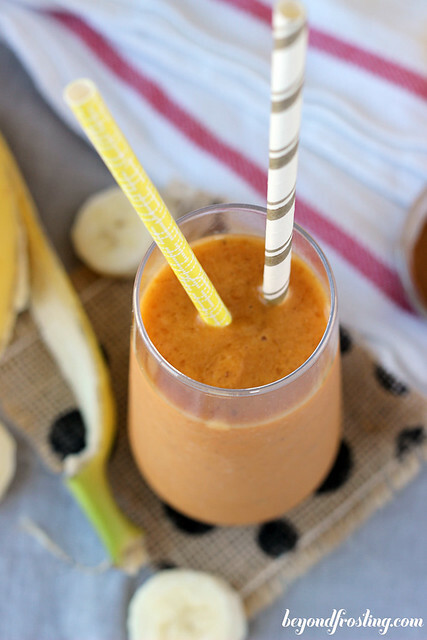 Breakfast became exciting for me when I started making these Skinny Pumpkin Banana Smoothies. This is another recipe I got from my sister. I mentioned in my recipe for Make Ahead Green Juice that she is a personal trainer and certified nutritionist. 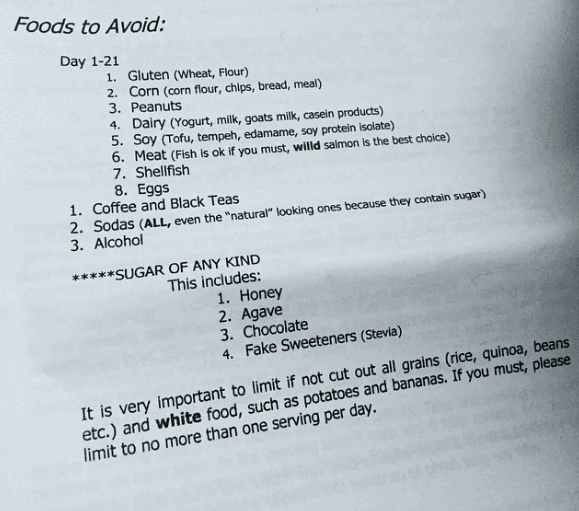 One week back in November, I did a 7 day cleanse. No grains, no wheat, no sugar, no ANYTHING. Literally, nothing. Just see my Instagram photo– which is probably my most commented on photo EVER. Although I did alter my cleanse a bit to fit my needs- like coffee and bananas. This smoothie was a lifesaver for me during my cleanse. I know I am not the only one who LOVES pumpkin. At first I was skeptical to combine it with bananas, but it is actually fantastic! Pumpkin totally has a place in my world outside the month of October. 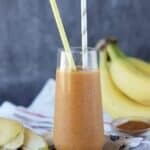 For this smoothie you can use frozen or fresh bananas. Frozen bananas will create a more frothy texture, which I prefer. 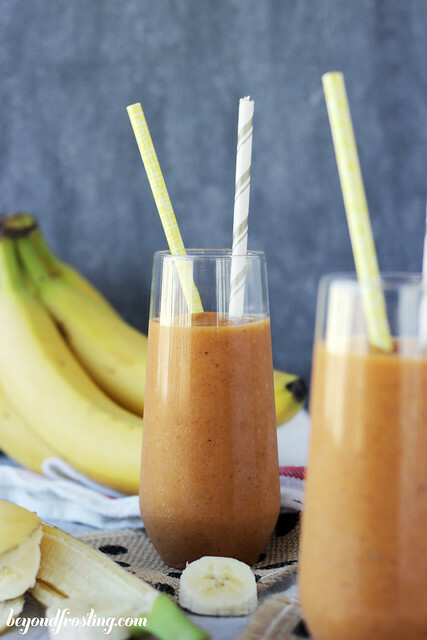 You definitely need to be sure to add ice if you are using fresh bananas because both the pumpkin and the bananas are at room temperature and no one likes a warm smoothie! I am able to make 3 smoothies from one can of pumpkin puree. 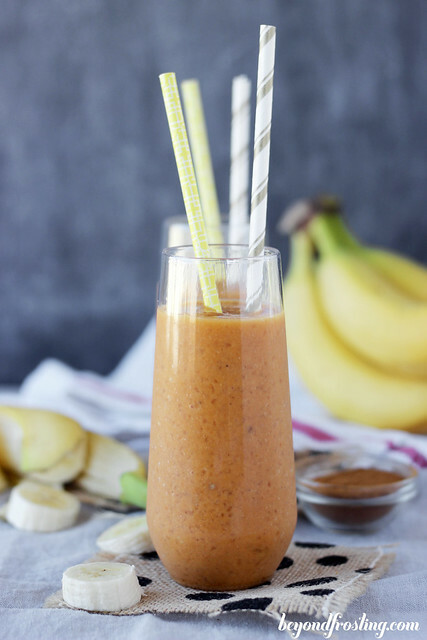 All you need for this simple smoothie is a banana, cinnamon and a sprinkle of nutmeg for flavor. I also use unsweetened vanilla almond milk instead of nonfat milk, but either one is fine. My sister suggested to add dates for flavor. Personally, I find dates a bit annoying to work, but I would absolutely suggest to add them to this smoothie. So I have been dying to update you guys on my progress with my weight loss! I shared a long story about my journey back in the beginning of January. Now that it has been a month of strict diet and exercise, I am so happy to say that I am down 4 lbs! That is about a pound of week, which is healthy weight loss! Now keep reading if you are interested or just skip to the recipe! You’re choice, I won’t be offended. I’ve been following Weight Watchers. It is the only thing that works for me. I am pretty good about recording my food intake and monitoring my points. I also got a Fitbit which links directly to my account and records my activity points for the day. I am also totally obsessed with hitting my daily step goal. Since I have started watching it, I am constantly making an effort to get more steps in. Now I said strict dieting. That isn’t too say that I didn’t “cheat”. I went to Lake Tahoe for a weekend and totally indulged. You know what? I got RIGHT back into my routine the day I returned from my trip. That is the important thing for me. If I have a day where I just can’t seem to gather the energy for a workout, or I get off track with eating, I have to get back on track immediately the following day. It is OKAY for me to have a slice of pizza, but I pair it with a plate of veggies, which I eat first. It is OKAY for my to take a couple bites of cake every once in awhile. It is OKAY for me to have a glass of wine. All of these things I have done over the past month and guess what, I still lost weight! It’s all about balance. Once thing we implemented in our house is a mandatory walk every night- at least one mile. It is actually pretty awesome. It is a time when we can focus on each other, device free and just talk about our day and what’s going on in our lives. Let’s talk about what I am eating! I try to get in as many vegetables as I can and I use them as fillers. Even if no one else is eating them, I still make myself a big plate! I also drink a lot of that green juice pictures above! I have been eating a TON of spaghetti squash. I make it ahead of time and it makes about 3-4 meals for me depending on the size. I hope I don’t burn out on it, because the squash is zero points! I started making these egg muffins, which have been amazing. I fill up on protein in the morning and it lasts me well into the early afternoon when it’s time to eat lunch. I add in a sausage, sautéed spinach and onion. The recipe can easily be adapted for however many muffins you need. For each muffin, I use one egg and one egg white. Each muffin is 3 points, and I usually eat 2 for breakfast. I snack on single serving packages of apples, carrots, cheese sticks and an occasional 100 calorie pack of pretzels or something to get my salty fix. I do eat lots and lots of chicken. I make it at the start of the week so it is easy to throw on salads or spaghetti squash. I measure out my portion size for everything. I have this EatSmart Digital Kitchen Scale and it takes hardly any extra time. I measure out my spaghetti sauce, weigh my meat portions, olive oil, salad dressing- EVERYTHING. This is the only way I can control my points. I also bought a Spiralizer ! So far, I have only used it for zucchini, but there are lots more foods I want to try, I just haven’t had time to experiment yet. If I am looking for dessert, I usually turn to Weight Watchers 1 point Fudgsicles. They are a life saver for me. Plus I made a few healthy desserts- see below! I drink a TON of water and I have pretty much given up Diet Coke. This is so huge for me, I couldn’t even begin to imagine that would have happened. I encourage you to follow along on my Instagram with the hashtag #bfgoals15 where I share some of my meals I am eating and what I am making! I fell SO much better both mentally and physically. I notice changes on my body. Particularly with my “tire”. It is much less noticeable that it was 4 pounds ago. I can already tell that my clothes are not fitting as tight and that is a GREAT feeling! It has helped my overall self-esteem and I am walking with a bit more confidence in my step. I have a goal to work towards. In June 2014 I was about 145 pounds. In October I was 156 pounds. My first goal is to get back to my June weight. I know I was not satisfied at that weight, but I have to have small obtainable goals to work towards. “I need to lose 25 pounds” is daunting. Start small and celebrate your goals. My goal is to be under 150 pounds by the time I am heading to Florida a month from now. Between now and then, I’ve got some work to do. I have trips, extended office hours and some events to go to. This just means I need to be prepared to navigate it and if I get off course, there is no reason that I can’t get back into it. Thanks for sticking with me. I know it’s a long one! 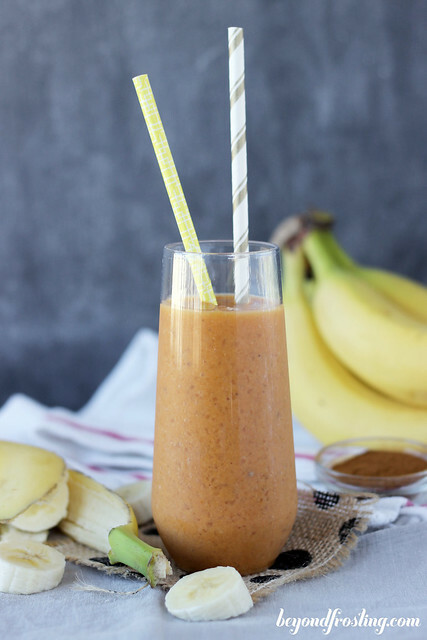 The perfect breakfast smoothie combines pumpkin and banana with a sprinkle of cinnamon and nutmeg. Combine all ingredients in your blender and mix until smooth. Serve over ice if desired. Leftover pumpkin can be stored in the refrigerator- covered with tin foil. Hi Julianne, do you think I could use water instead of almond milk? I should think so! I haven’t tried it myself but any type of liquid should work. 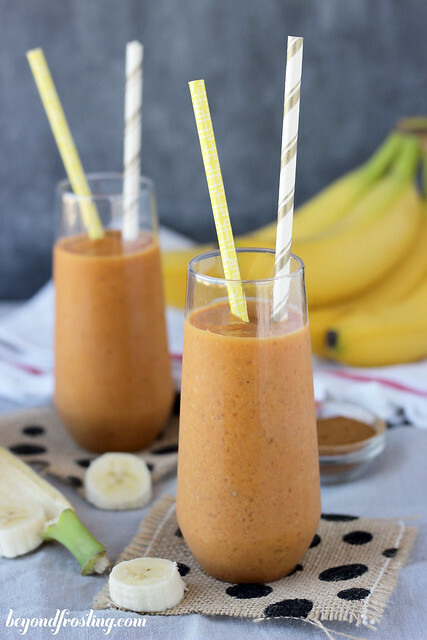 I have been making this smoothie this week and I LOVE it! It is so filling that I am finding I don’t need a mid-morning snack. Thank you for sharing this recipe. I am glad to have it as part of my routine now. I have always struggled with my weight but recently lost over 40 pounds and I have been able to keep it off for 6 months now. Good luck with your journey and congrats on what you have accomplished! I know it isn’t easy, especially when dessert is involved! 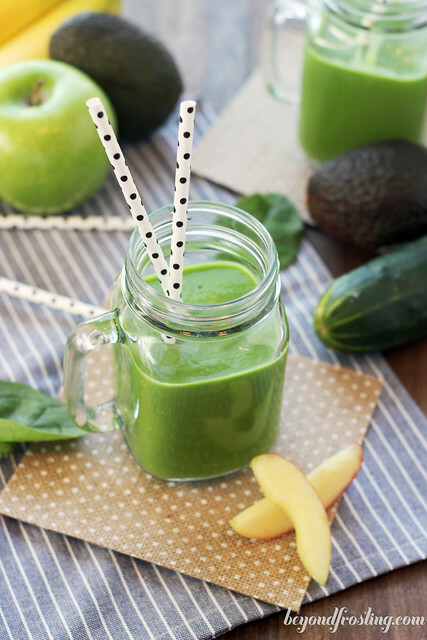 This smoothie looks absolutely amazing! I have been eating tons of spaghetti squash too! It is so freaking good! Congratulations on your success! Keep it up!! Julianne, what a great post!! I think what you’ve already done is awesome. . and losing 4 lbs the healthy way is the way to go! and I love that you are doing smaller, more attainable goals. . and LOVE that you guys are walking every night! That is the best! It’s so important to have the support of your loved one when dieting and basically changing your lifestyle. . glad to hear that your boyfriend is on board and supporting you. that walk where you guys are device free and just talking about your day is awesome!!! and I love this smoothie!! I struggled with my weight my entire childhood through adulthood. I was a very chubby kid and was always on diets ever since I can remember. Anyway, for me, it was just portion control and exercise and this is something I’ve been doing and maintaining for like the past 8 to 10 years. You can do this, sister!! Sounds awesome! I do love bananas in my milkshake to! Your sister made this? I love the different flavors here! Yes! She gave me the recipe to try during my cleanse and I have been drinking it ever since. 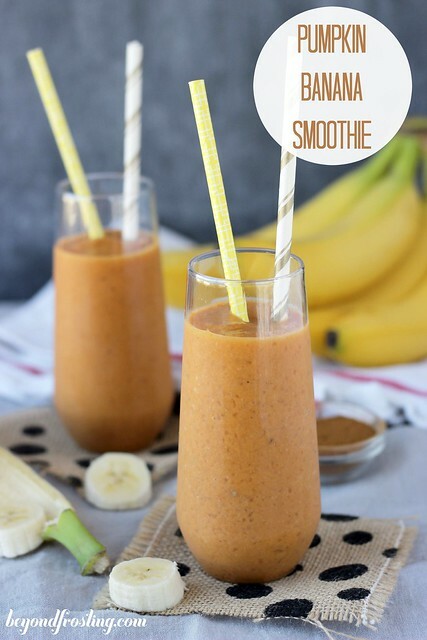 Just made this for my mid-morning snack and, wow…this is SO good! will love this. Thanks for this amazing post!! Hi Anne!! Thanks for stopping by! I am so glad you tried it!